Today is Valentines’ Day, but since I love SPACE, I’d rather talk about today being the one year anniversary of the Chelyabinsk impact. We learned from the more than 1000 injuries that the thing NOT to do during an interesting meteor event is to stand near a window. We also learned that Russia has an overabundance of dash cams for various reasons. We may have learned some Russian curse words without realizing it. Most importantly, we did learn, or re-learn, was how vulnerable the Earth is to debris from space. Earth picks up several tons of material a day, sweeping it out of the solar system as we orbit the Sun. Most of it is too small to noticed, and almost all burns up in the atmosphere. One that makes it as far as the Chelyabinsk rock did can be scary, but they also leave behind precious samples of the early solar system for collectors and scientists alike. 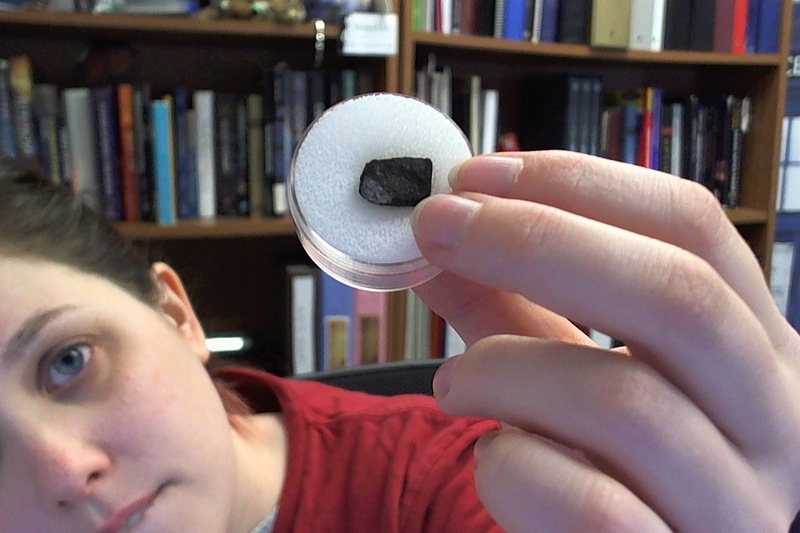 In fact, I was very fortunate to later receive a small piece of the Chelyabinsk meteorite as a gift from my friend (and current 365 Days of Astronomy producer) Richard Drumm! You may have seen me whip this bad boy out of my purse on occasion for on-the-spot science outreach. People are pretty excited to see and handle a real rock from space, and it is chipped in just the way that it shows some of the stony, chondritic material inside as well as the fusion crust around it from its hot ride through the atmosphere. The impact coincidentally happened the same time we were waiting to see a very close approach of asteroid 2012 DA14. The events were unrelated, which made the point even MORE for vigilance in the face of possible disaster from space. Space is beautiful and wonderful and dangerous. I hope that the studies we take part in not only satisfy your curiosity for science, but that the planetary and astronomical observations of our time will lead us towards a safer future where we can start to think about how to protect Earth from such a devastating event. Even if the “big” one isn’t big enough to wipe out humanity, a poorly-placed asteroid still has the potential to wipe out an entire city. The people of Chelyabinsk were both fortunate to witness such an event without loss of life, though unfortunate in injuries and property damage.